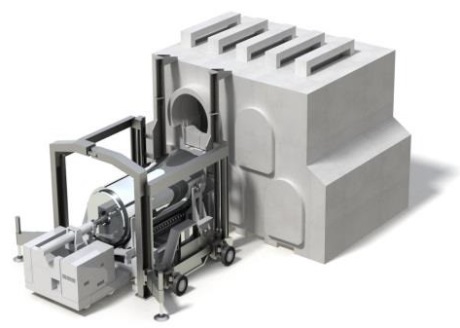 Areva TN has launched the NUHOMS Matrix advanced used nuclear fuel storage overpack, which it says "addresses the challenges faced by its customers in storing used fuel safely, efficiently and competitively". The system can reduce the footprint of on-site interim fuel storage facilities by almost 50%, the company says. Areva's NUHOMS dry shielded storage canisters store used fuel in a horizontal position contained within a sturdy, low-profile, reinforced concrete structure. The company says the use of the Matrix system - a unique two-level horizontal and modular set-up - reduces the footprint of a storage facility by 45%. This in turn, it says, reduces storage pad construction costs. "This makes NUHOMS Matrix the smallest storage pad on the market for the same capacity, in a context where space is at a premium on nuclear sites," Areva said. The Matrix system has been designed to accommodate canisters of varying sizes and can store "high burnup short cooled fuel", such as that from decommissioned reactors. The system incorporates new features and devices that allow for a complete inspection of the canister without removing it from the module. "Aging management and retrieval of canisters for future transport to a consolidated storage site have become a challenge for utilities," Areva said. Areva TN Americas president Greg Vesey said, "As more communities, policymakers and utilities across the world discuss securely storing used nuclear fuel, our NUHOMS Matrix system is a competitive, safe and timely solution for those needs and concerns."